A bicycle artwork built for two. 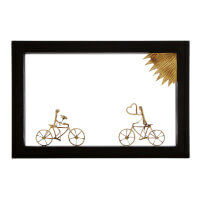 Celebrate a couple of bike lovers with George Roumanas's Ayous wood shadowbox display. He breathes life into molten bronze by sculpting the warm-hued metal into a pair of sweethearts taking a romantic spin in the glow of the afternoon sun. Handmade in Greece. USA Exclusive at UncommonGoods. Take a tour of George's Athens studio and take in some of his own words of wisdom on the blog. 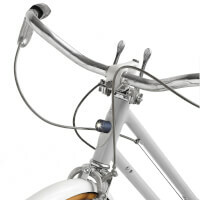 Whether you're a BMX rider or a Brooklyn hipster, the bicycle is more than a vehicle: it's a way of life. Chart the evolution of this two-wheeled wonder with this genealogist-approved infographic. 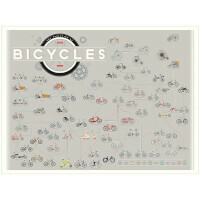 Printed with vegetable based ink, this colorful graph includes all the famous, infamous, and sometimes ludicrous bike styles in an easy to read, historically accurate chart. 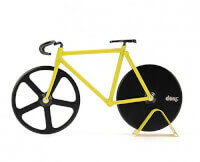 Evolution may not be an exact science, but repairing a fixie certainly is. Made Ben Gibson and Patrick Mulligan in Brooklyn, NY. From the misty shores of Maine to the park down the road, you never know where a good book--or bike ride, for that matter--can take you. 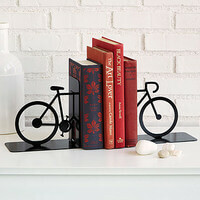 Celebrate the journey a few pages or pedals can inspire with this charming set of bookends, handmade by Eric Gross from carbon steel and then painted to resemble a cycling silhouette. 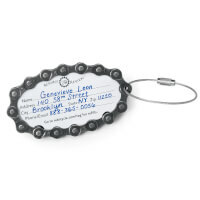 Handmade in Brooks, Kentucky.